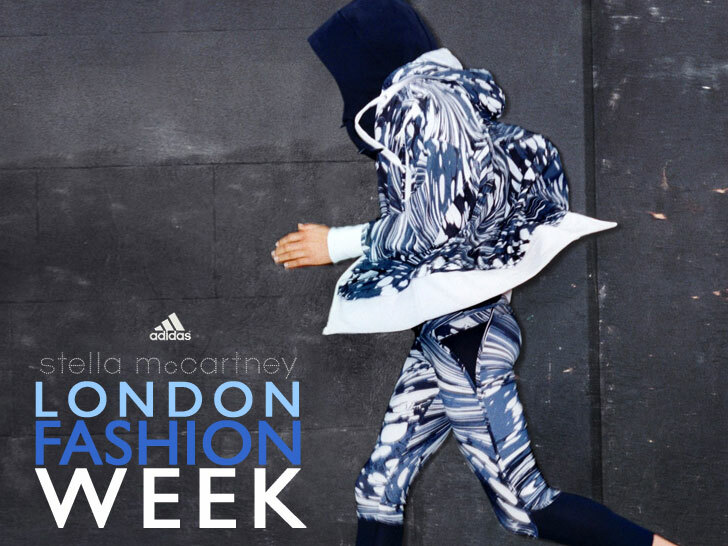 Stella McCartney is upping the green ante at Adidas. The ethical British designer, who presented her diffusion collection for the sportswear giant at Spring/Summer 2014 London Fashion Week on Tuesday, feted a peppy, retro-cool lineup of activewear that placed an increased emphasis on sustainability, including the use of organic cotton, recycled polyester, and Adidas's water-saving "DryDye" technology. "We also have made a real effort to reduce on surplus waste," McCartney says in a statement. Adidas says it employed “advanced, eco-friendly” cutting techniques to ensure that at least 95 percent of the fabric went into the final product. (The industry average ranges between 80 to 85 percent.) The remaining 5 percent was recycled or repurposed to ensure that no surplus material went to waste. Once in production, the collection will offer the “perfect performance/style option for those mindful of their carbon footprint,” the company adds. Adidas says it employed “advanced, eco-friendly” cutting techniques so at least 95 percent of the fabric went into the final product. The German firm also made good on its promise to integrate DryDye into a greater proportion of its products. Unlike conventional dyeing methods, which require an average of 100 to 150 liters of water to process a kilogram of fiber, DryDye uses a pressurized form of carbon dioxide. Heated up to 31 degrees Celsius (88 degrees Fahrenheit) and pressurized to 74 bar, CO2 takes on the characteristics of both a liquid and a gas, allowing it to penetrate fibers and disperse preloaded dyes without other chemical agents. Adidas says it employed "advanced, eco-friendly" cutting techniques to ensure that at least 95 percent of the fabric went into the final product. The remaining 5 percent was recycled or repurposed to ensure that no surplus material went to waste. Once in production, the collection will offer the "perfect performance/style option for those mindful of their carbon footprint," the company adds. The German firm also made good on its promise to integrate DryDye into a greater proportion of its products. Unlike conventional dyeing methods, which require an average of 100 to 150 liters of water to process a kilogram of fiber, DryDye uses a pressurized form of carbon dioxide. Heated up to 31 degrees Celsius (88 degrees Fahrenheit) and pressurized to 74 bar, CO2 takes on the characteristics of both a liquid and a gas, allowing it to penetrate fibers and disperse preloaded dyes without other chemical agents. McCartney had her first run-in with DryDye in 2012, when she designed a blue-and-white leopard-print tee for Adidas by Stella McCartney’s fall collection. Adidas developed DryDye with the help of DyeCoo Textile System, a Dutch firm that pioneered the process. The collection also boasted signature "Stella" shades, such as dusty rose and pale maroon. Inspired by the colors and dimensions of the urban skyline, the garments are a " play on contrast," McCartney says. Another focus? Keeping athletes comfortable while they're sweating it out. McCartney used lightweight, breathable fabrics installed with "instant cooling dots." Like all of McCartney's designs, the pieces eschew animal products like leather. In addition to your typical workout-friendly layers, the Spring/Summer 2014 line also includes jackets, swimsuits, footwear, and gym bags. McCartney's activewear is known for its feminine silhouettes and bold, graphic slant. Women shouldn't have to sacrifice their style for sport, she says.